U.S. MILITARY ACADEMY, WEST POINT, N.Y. -- The New York Army National Guard’s 42nd Infantry (Rainbow) Division paid respects in an evening wreath laying ceremony here for the unit’s founder and first chief of staff, General Douglas MacArthur. Standing before the statue of General of the Army Douglas MacArthur adjacent to the cadet barracks to present the wreath were Brig. Gen. Steven Wickstrom, 42nd Infantry Division Commander and retired Command Sgt. Maj. Martin Allen, representing the division headquarters chapter of the Rainbow Division Memorial Foundation. The National Guard contingent included six past Rainbow Division commanders, representing decades of leadership in the Army National Guard’s historic division headquarters. MacArthur is credited with the idea of the Rainbow Division’s nickname during the unit’s organization for overseas service in 1917. 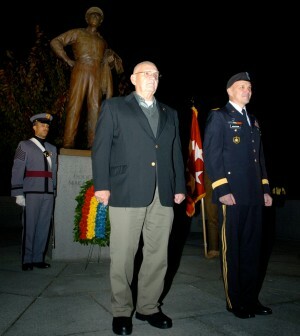 The division command lays a wreath at McArthur’s statue here annually to commemorate his role in the division’s history. The division would stretch across America like a Rainbow, MacArthur said to local reporters near Camp Mills, now present day Garden City, Long Island. The nickname reflected the gathering of Citizen Soldiers from 26 states and the District of Columbia for service in France as America rushed to field combat forces for service in 1917. MacArthur went on to lead the division’s 84th Infantry Brigade during the St. Mihiel offensive and the battles in the Meuse Argonne through the fall of 1918. He went on to command the division in the final days of the war before the division assumed occupation duties along the Rhine from 1918-1919. It is fitting that the memorial for MacArthur’s legacy of leadership that began with the 42nd Infantry Division in WWI would be here at West Point , Wickstrom said. Joined by a contingent of West Point cadets and Soldiers and staff of the 42nd Infantry Division Headquarters Company, Wickstrom and Allen presented the wreath and a hand salute to MacArthur. The honors were on behalf of all Rainbow Division Soldiers, past and present, Wickstrom said.